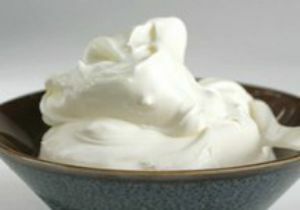 Mock Devonshire Cream recipe gives you a quick solution and time saver for an easy topping for your desserts. Devonshire Cream was originally from Devonshire County, England. The original Devonshire Cream is a thick, buttery cream often used as a topping for desserts. It is still a specialty of Devon, Cornwall, and Somerset, as this is where the right breed of cattle are raised with a high enough cream content to produce clotted cream. It is also known as Devon cream and clotted cream. Clotted cream has a consistency similar to soft butter. Before the days of pasteurization, the milk from the cows was left to stand for several hours so that the cream would rise to the top. Then this cream was skimmed and put into big pans. The pans were then floated in trays of constantly boiling water in a process known as scalding. The cream would then become much thicker and develop a golden crust which is similar to butter. In a large bowl, combine cream cheese, sugar, and salt; stir until well blended. With an electric mixer, beat mixture until stiff. Store in refrigerator. Makes approximately 3 cups or enough to serve 12.